We all remember the joy and fun we had as kids swinging whether at home or at the local park, it gives us that rush and feeling of being immersed into another child-like and care-free state of being. The back and forth motion feels fantastic, especially when friends come and join in together swinging the day away, which is great for a kids development. Swings should be shared by all and in this review, my aim is to share with you the various options available and what could be potentially your next swing, exploring its benefits, awesome features, and my personal thoughts. There are loads to cipher through, but I’ve narrowed it down to the ones I personally feel are worth buying and can give your loved ones a swing to remember. 3.0.1 Setting up Kids Swing Sets – How to Hang a Swing from a Tree? There are loads of types of swings and choosing the right swing at the right price is difficult, so below we have put together some of we deem to be the best swings, both in terms of price, features and fun for the kids! This multi-purpose swing has all the essentials for the kids to have a great play out in the back garden and has 5 main features, ranging from 3 swings, a ladder, crow’s nest, slide and 1 trapeze bar with gym rings. Designed for safety with no hard edges which are rounded or covered with plastic caps prevent pinching, it’s very safe for older kids. The Top beam is safe and secure with 5 years warranty, which allows the largest kids (yourself) to play without worrying about it collapsing. This really is a sturdy construction and very easy to assemble, it’s just a matter of spending the afternoon with the sun shining and having the kids watch for a while in anticipation. This lovely swing set has two swings and allows kids to play on it at the same time, which saves those unwanted quarrels and unnecessary disagreements of who is to go first. The glider on this product is loads of fun and again is for two kids to enjoy together and will add to the dynamic fun. This double swing and glider is a great option if you’re looking to allow up to 4 kids a fun afternoon in the garden out back. The simple sturdy design allows for durability and simple pure joy. The ropes of the swings are adjustable depending on the heights of the possible siblings or friends that want to enjoy. This product is cheaper than some of its other competitors, although it boasts less, it still has the core functions of the others swings, but maybe a little less flare as the others. 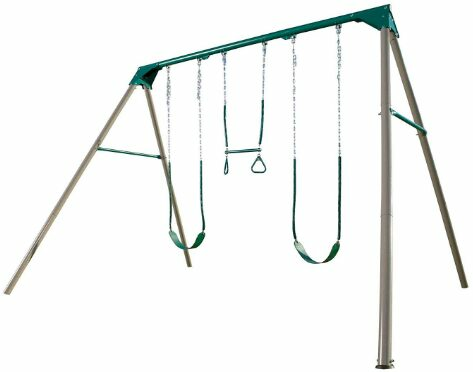 The Neptune swing still has a solid casing and is steel coated, its seats are blow-molded and come with an easy to use instruction sheet and assemble really easy. 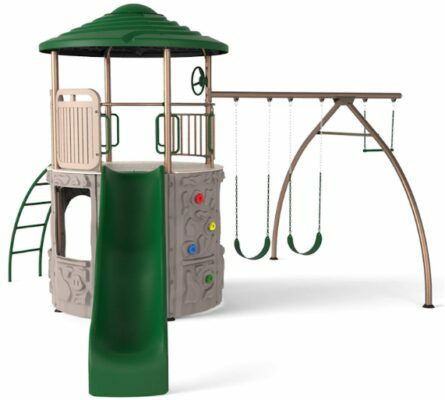 This freestanding deluxe playset with slide, swings, fireman pole, trapeze bar, monkey bars and a tower is one of the most expensive swings/playset in the review. This, however, doesn’t mean you are not still getting your money worth. This is ideal for the perfect home and for those with the budget this truly is a great buy and you need to check out what me and others are saying about it. This has loads of reviews and there is something constant about them, which is a sign this is a great buy for parents wanting to get the best swing for their kids. 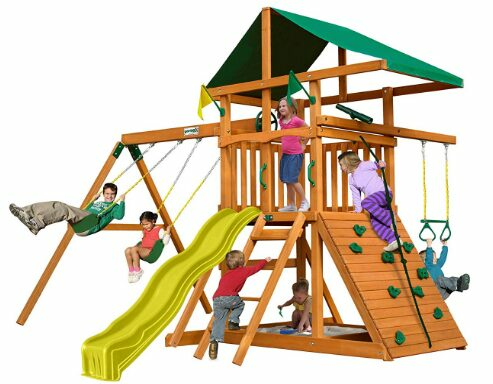 This one is ideal for the kids and allows up to four kids at one time to play whether it’s swinging and singing songs, monkeying around on the monkey bars or even sliding down crow’s nest. The adjustable swing rope allows for all ages to have a go and even yourself if you’re feeling kid-like. The metal swing is a great look and will look lovely in most if not all gardens. This requires self-assembly and is easy to use if you’re keen on getting the kids outdoors it’s well worth it. The cute little slide reminds me of a wishing-well and as a child I used to makes wishes every time I went down one, because of my granddad who said make a wish and it will come true but make sure not to tell anyone what you wished for, so I’d better not say anything just yet. This outdoor swing is for both children and adults and is a fantastic choice if you’re looking for a basic swing type that’s loads of fun. This can easily be attached to a wooden frame and is made from heavy duty metal which spans 66 inches in length. This can easily be attached to a wooden frame and is made from heavy duty metal which spans 66 inches in length. The chain has a special yellow plastic coating to stop little children’s fingers getting pinched when swinging. The max weight capacity is 300 lbs and easily attaches to other jungle gym swing sets. This is one of the easier swings to build and is something that can easily be assembled for those not so DIY savvy. 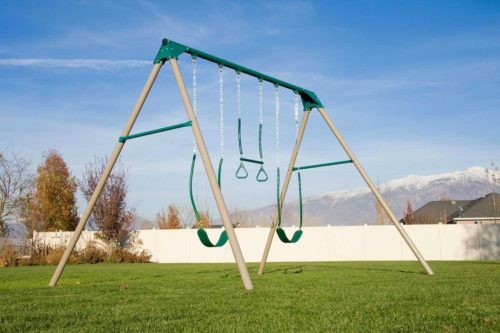 This is a top rated swing and can have several kids using it at once. The adjustable ropes and wide 39-inch base make this a fun swing to have in the garden. This outdoor swing can handle 600 pounds and will even handle a father and son using it at the same time. 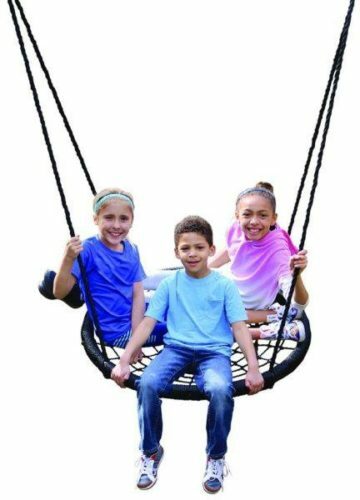 The web riderz model type of swing has a swing and spin motion, which adds an element of surprise to the swinging motion. The large steel frame is tightly woven to the rope and is very secure for swinging with. This would ideally be used to tie from a tree or a metal frame for use outdoors. This swing is meant for use with children 3 years old to 15 years of age. This swing garden set is for dual use and kids love it for the simplicity of its design and basic function. This swing allows them to swing with their best friends and have a great time in the garden on a hot summer’s day. This swing is powder coated steel and will last years without any rust or unwanted blemishes. The flat packed delivered design allows an easy assemble with its pre-drilled parts. This swing comes with ground anchors for concreting into the ground and can ensure the safety of your children. The adjustable swing height allows for this swing to be used over a long period and for the years to pass with the height being slowly adjusted. This type of swing is ideal for older kids and I would recommend this as a swing sets for 12 year olds. Most older children at this age want to be able to use a swing are less interested in climbing frames and slides. 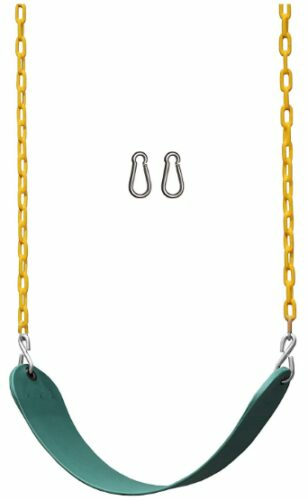 This hanging platform rope tree swing is ideal for multiple children and is a solid construction made of steel with resistant fabric mat, which can hold up to 400 pounds. Th think rope and large supporting frames make this ideal for siblings to enjoy swinging on all at the same time. The sturdy frame makes it easy for children to hold onto and can either stand or sit on at the same time. The mesh seat is comfortable to sit on and is safe for swinging on. The assemblage of this is kids swing set is fairly straightforward and has a 60 inch by 32-inch hanging platform. This big kid swing set is designed for children aged 3 to 12 years old and as you can see isn’t designed for children under a certain age and height. 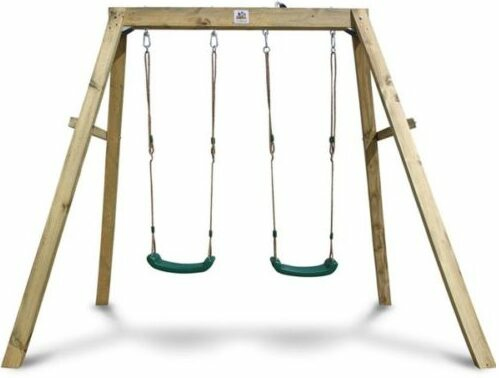 This swing includes 2 belt swings, 1 trapeze bar and is a solid construction which is ideal for larger children. The material, as expected, is all-weather made and is designed to last all seasons for definitely a few years of constant use. Note that it isn’t easy to assemble and it’s important to follow all the instructions and don’t be bring one of those “it’ll be fine” attitudes to this one because it needs to be built right from the offset right or it won’t work on completion. The space required is around 12 feet and the total area is 112″ H x 125.5″ W x 162.5″ D and the main pole across is just under 8 meters. This really is a good price and middle of the range in terms of cost, but as far as construction it competes with the rest in terms of quality and has great reviews. This is a metal swing sets for older kids who really just want to swing and hang on the monkey bars. 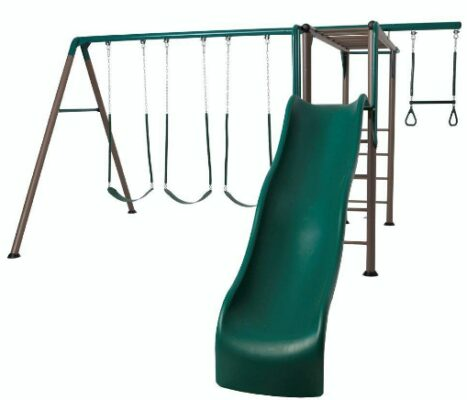 This highcrest swing set is majorly popular and can handle your kids and their friends, leaving them to play and enjoy the outdoors. This cedar wood finish is beautiful and when the kids want a rest they can enjoy the seats provided. There are two swings and a monkey bar which are all adjustable and loads of fun. The spacious upper deck is roomy and is beautifully designed with yellow and green. The slide is 8 foot and super fun but not risking your kid’s safety. The kid’s rock climbing ladder is the stairway to heaven cause at the top leads to the slide, which is a kids idea of heaven. The best swing for the cost and stilling giving the kids a great time outdoors has to be the Flexible Flyer Fun Time Metal Swing Set with its, up to 4 kids at one time, it’s really great value. They can monkey around, swing to their heart is content or slide down the shooting slide until they find a pot of gold. The best in my humble opinion is by far the all in one backyard childrens discovery Lifetime swing. 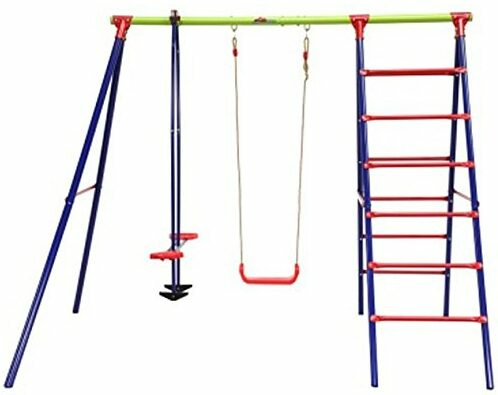 This Monkey Bar Adventure Swing Set with 8 Foot Wavy Slide is a great swing for older children to use and swing on, slide on or just hang around. This one is heavy duty and made to last, low maintenance and will not crack. With three belts, soft grips, trapezium bars, gym rings, monkey bars and slides, it’s really going to allow your kids to make the most of the back garden. This is more expensive than most other similar swings, but for me the best in terms of fun for kids, then it is by far the best product. Setting up Kids Swing Sets – How to Hang a Swing from a Tree? There are many ways to set up a swing and although there are different types of swings there are some commonalities that go across the board when setting up a swing from a tree branch. Tree Type: The sturdy hardwood trees are some of the best types you would want to attach a rope to and solid wood trees like oak are some of the best. Branch Size: Horizontal branches are best and with an 8 Inch diameter is ideal. Branch Condition: Some parents might not know the difference between healthy tree branches and from dead wood. Sometimes infestation can take place underneath the outer bark, so splitting some to look inside is a good ideal. Clearance: Make sure there is at least 6 feet away from the trunk of the tree and so there isn’t any chance of swinging back onto the tree base.